Gatherings of the whānau around a table groaning with mouth-watering kai were Monique and Henry Heke’s heritage. 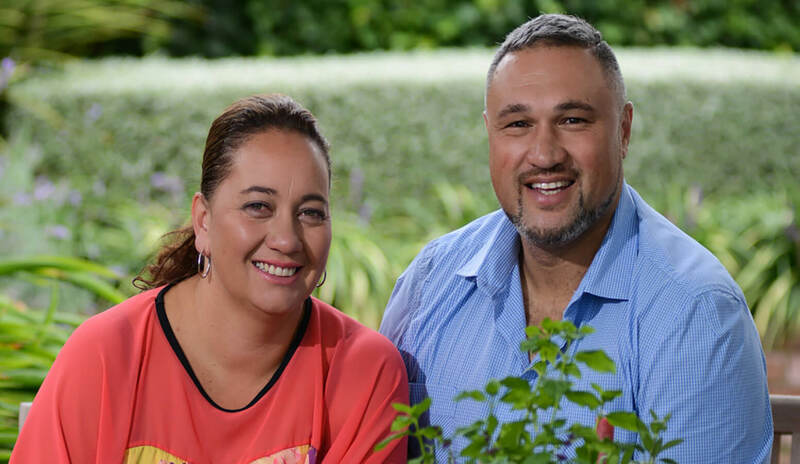 Now they’re sharing their love of food in a television programme infused with their signature style of warmth, humour and profound Māori knowledge. In Polynesian Lore, food is the lynchpin of social life: an opportunity to gather friends and family together while indulging in traditional fare. A custom which not only provides nourishment for the body and the spirit, but also acts as a constant reminder of cultural roots to be cherished and nurtured. This was Monique and Henry Heke’s rich heritage. Both were brought up in big Maori families where home cooking was the hook that brought everyone together on a regular basis. But more importantly, mealtimes provided them with a knowledge of good nutritional food at a very early age … with a strong Maori influence. “We had a very traditional family routine at mealtimes,” says Henry. “As good Catholics it was fish and chips on Friday, a roast on Sunday – but all homemade. Mum made bread, and such bread you could not match. She has sweet hands. We didn’t have KFC in New Plymouth (his home town) and Monique’s mother, Yvonne, made fried bread even she can’t match to this day.” Probably a debatable point if you try Monique’s take on that traditional staple of Fry Bread with butter and jam. Irresistible! He recalls that when he went to boarding school (Frances Douglas Memorial College) he’d stock up on flatbread hot out of his family oven, wrapped in a tea towel to bring back to the hostel. It’s not the size of the crowd that matters but the perfection of the food. 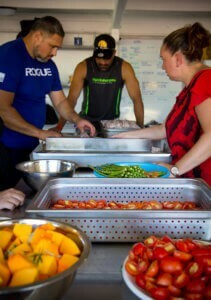 Monique and Henry were invited by the Chairman of Ngati Kahuraunu Iwi Inc., Ngahiwi Tomoana, to cater the powhiri at the Waipatu Marae for the Taniwha Dragon Economic Summit – here they demonstrate their culinary skills. With such memories of their childhood, it is scarcely surprising that both – who have been together now for some twenty years – are natural cooks. Henry laughingly admits that he wooed Monique through her family by cooking for them. “I’d come bearing gifts of food and would cook up a storm in the kitchen – meatballs (recognised by her family as the best ever), chicken paprika and pies.” It is to her credit that Monique simply smiles at this bravura, not letting on that she too was a pretty dab hand in the kitchen probably until the whole family was convinced they were meant for each other. The magic they made in the kitchen became well known. “Well, we can’t cook for one or two; there’s always a big pot on the stove. Food is really the story of our lives,” they agree. As regular stallholders at the Hawke’s Bay Farmers’ Market their delicacies gained recognition. So when word spread one Sunday that the MKR (My Kitchen Rules) crew were around searching for talent in a “Battle for the regions” series, it was a natural that they should be approached. The story of how it happened di ers according to who is doing the telling. Henry is convinced that friends and family suggested they should sign up. However, Monique claims (and knowing the couple, it’s probably the more likely version) that Henry noticed them as he’d seen they were scouting on Facebook and went over for a chit-chat. The result? They were signed. And went on to become the much loved runners-up. Their rhythm then – anticipating each other’s every move … making split second decisions with a flick of the eye – won the audiences. It also garnered interest from other television channels and after a series of ‘maybes’, which included cooking for producer Cindy Lucas (who now produces their show), currently they are holding great ratings as they create family fare for Maori Television in Tradition on a Plate, all based on a hunting and gathering philosophy which is entirely attributed to their own upbringing steeped in the tradition of Maori recipes. They both agree that the fact everyone sat down at the table for meals was the foundation of their own love for gathering friends and family and entertaining a lot. It is also the theme of their current show in which their whanau are all involved. Their two daughters – Keita, 9, and Mahina Rangi, 5 – are old kitchen hands. “Keita makes the best pancakes,” says Monique proudly. They are in the show as are parents, uncles, aunts, cousins and anyone else who happens to be around. They hunt and gather the ingredients, so this is no supermarket stalwart. Everything is from scratch. And their easy humorous repartee, which switches from te reo Maori to English on a regular basis, makes for real viewer appeal. 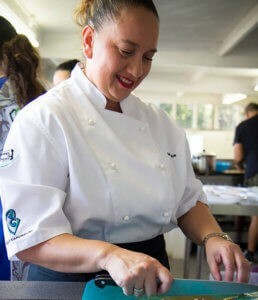 Whilst explaining the intricacies of producing traditional Maori fare in a manner which can’t help but entice anyone to try the recipe, they demonstrate techniques and describe ingredient backgrounds with a real warmth and passion gleaned from their vast and unique cooking background. Ko Iwi Poaka, pork bones and watercress, was a staple in the 70s, but given the Heke touch this traditional dish is sure to become a must on any cook’s agenda today. And their Ka Pai Kahawai with Karengo Teasers and Creamy Riwai Mash which opened the fi rst episode was enough to seduce any palate. And send viewers racing to the website to fi nd the recipe. Pig and deer hunting, crayfi sh trawling, gathering mussels and paua, mutton birds and watercress are spearheads to each segment. Everything has been filmed in Hawke’s Bay. “Well it’s such a great growing region, we were adamant that we had to film here. We have some 52 wineries, so the marriage between food and wine is pretty well unique to the Bay. And we would also like to see Hastings develop a real food culture. It’s happening. Artisan food is very popular and we have the most wonderful French bakery,” Henry comments. Both still work full-time for Te Puni Kokiri and are quick to give credit to “very supportive bosses who wanted to see us succeed”. Despite their immensely busy schedule, they are keen to develop their own brand. A second series is hopefully in the offing, as is a book. But most of all they are very aware of the responsibility they have as representatives of their family and Maoridom. “So we don’t want to fail,” says Henry. With their genuine and delightful approach to reviving a cultural tradition – not forgetting their good looks, humour and great food – failure is not in the cards.